Breadcrumbs are easy to make and a great way to use leftover bread that is past its prime. 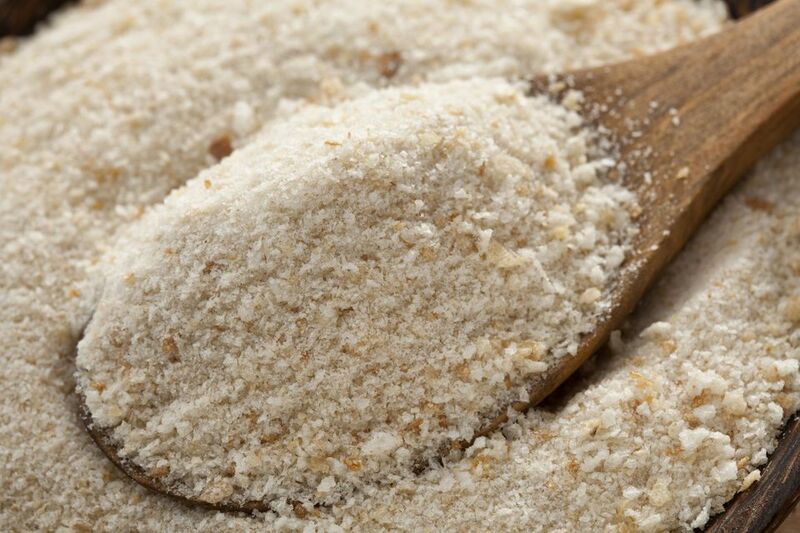 Dry breadcrumbs are called for in numerous recipes: a crunchy topping for casseroles, as a binder in meatloaf or turkey burgers, and a coating for chicken cutlets or crispy fish. There are two types of breadcrumbs called for in recipes: fresh breadcrumbs and dried breadcrumbs. Fresh breadcrumbs are simply finely crumbled bread; they have a light, moist texture and don't keep well. Dried breadcrumbs are fresh breadcrumbs that have done some time in a low oven. They keep for months at room temperature or in the refrigerator. Here are two easy ways to make dry breadcrumbs, one that uses a food processor and one that does not. Preheat the oven to 250 F (120 C). Trim the crusts off of the bread. Break up the bread into chunks no larger than 1 inch. Lighter loaves such as white flour baguettes can be left in slightly larger pieces. Dense, whole grain loaves need to be broken up smaller. Spread the chunks of bread out in a single layer on a baking sheet. Bake until the pieces are crunchy dry and just starting to turn golden (but not burned). This will take 15 to 25 minutes depending on the type of bread you started with. Remove the baking pan from the oven and let the bread cool for a few minutes. Transfer the bread to a plastic or paper bag. Use a rolling pin on top of the bag to gradually crush the bread into crumbs. Don't try to do this too quickly or you risk tearing the bag. Don't bother trimming the crusts off the bread if you are using a food processor to make your breadcrumbs. You can use this method to make both fresh breadcrumbs and dry breadcrumbs. For making dry breadcrumbs, you will need an oven and a baking sheet in addition to a food processor. Tear or cut the bread into chunks no larger than 1 inch. Transfer the pieces of bread to a food processor and process until the chunks are reduced to crumbs. Remove any large pieces of crust and discard. Now you've got fresh breadcrumbs, which you can use immediately. For dry breadcrumbs, spread the breadcrumbs on a baking sheet. Bake until they are completely dry and starting to turn golden (but not burnt), about 20 to 30 minutes, stirring the breadcrumbs often so that they dry evenly. Store your breadcrumbs in clean, dry glass jars or other food storage containers for up to 1 year. You can keep them in the cupboard, but if you live in a very humid environment, store dry breadcrumbs in the freezer or refrigerator to prevent spoilage. Discard breadcrumbs if you note any mold or detect off-odors when opening the container. If you wish to make seasoned breadcrumbs, you can add the seasonings either before or after drying the breadcrumbs in the oven. Usually, you will be adding dried herbs and seasonings such as oregano, thyme, basil, rosemary, parsley flakes, and garlic powder.